It has been requested that additional images be uploaded for this article. Remove this only when the image(s) have been uploaded for this article. Specifics: Model rips of Skeletal, Circus, Ice, Bullock, Party Animal and Mummy variants. Ankirons are enemies that Wario encounters in Wario World. 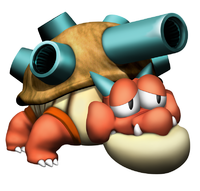 Ankirons resemble huge armored turtles with cannons sprouting out of their shell. In fact, Ankirons are so huge and heavy that all they can do is turn in place. Ankirons fire bombs with humanlike faces at Wario, who can throw the bombs right back. They explode after a short time, however. Ankirons can also hide in their shells to protect themselves against Wario's powerful punches. If Wario continues to punch a protected Ankiron, it comes out (though still unable to be damaged) and fires its ammunition (depending on species) in all directions. In addition, as Wario comments in the game's North American instruction booklet, these enemies smell like feet. Other varieties of these enemies include Skeletal, Circus, Ice, Bullock, Party Animals, and Mummy Ankirons. Aside from looks, Skeletal, Circus, and Ice Ankirons behave exactly the same way as normal Ankirons. The Party Animals can fire many bombs at once, while the Bullock and Mummy Ankirons shoot flaming bombs that damage Wario on contact until they cool off. However, the Bullock and Mummy Ankirons behave differently when they're attacked while protected, with the latter firing fiery bombs, while the former only fires normal bombs. Their name comes from Ankirosaurusu (アンキロサウルス), the Japanese spelling of the dinosaur name Ankylosaurus. In the Western localizations, their name is interpreted as a portmanteau combining the first three letters of said dinosaur name with the English word "iron". Kurisuron "Crysron", a portmanteau of "crystal" and "Ankiron". Hasukiron "Huskyron", a portmanteau of "Siberian Husky" and "Ankiron". Sirukiron "Silkiron", a portmanteau of "Silk" and "Ankiron". Sukerutoron "Skeletron", a portmanteau of "Skeleton" and "Ankiron". ↑ Wario World instruction booklet, page 25 (PAL) or page 31 (NTSC). ↑ Wario World Nintendo Power Player's Guide, page 86.